Provided photo Premier Health athletic trainers were recognized. 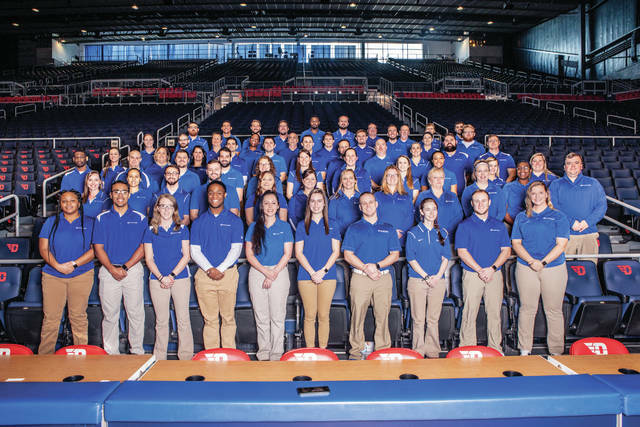 DAYTON — High school athletic trainers from across the Premier Health system were recognized for dedication and service at a March 5 luncheon as part of National Athletic Training Month at the University of Dayton Arena. The event highlighted 44 Premier Health athletic trainers, including 14 from the UVMC Center for Sports Medicine. The luncheon was held in conjunction with a bimonthly educational meeting for the athletic trainers, focusing on Ethics in Athletic Training. “Any athletic trainer’s goal is to enhance the quality of health of athletes and those who engage in physical activity within the community. The ultimate goal is injury prevention,” said Jenny Jones, PT, manager for the UVMC Center for Sports Medicine. Each certified athletic trainer at the UVMC Center for Sports Medicine is also licensed by the state and works with area schools to provide injury care and prevention, on-field evaluations, and education to coaches and athletes. The trainers are: Christin Perdue, MA, AT, athletic trainer at Miami East High School; Stephanie Burdette, MEd, AT, athletic trainer at Milton Union High School; Moe Ickes, MS, AT, athletic trainer at Bradford High School and Tippecanoe High School; Brian Downs, MS, AT, CSCS, athletic trainer at Covington High School; Erin Schmerge, AT, athletic trainer at Piqua High School and Edison State Community College; Corinne Lyons, MA, AT, CSCS, athletic training coordinator north region for UVMC Center for Sports Medicine and Russia High School; Justin Perkins, AT, athletic trainer at Troy High School; Aaron Schlotterbeck, MBA, AT, athletic trainer at Tippecanoe High School; Stacey Barnhart, MS, AT, CSCS, athletic trainer at Troy Christian High School; Kyra Dorney, MS, AT, athletic trainer at Troy High School; Alicia Price, AT, athletic trainer at Newton High School; Zach Rahe, AT, Annette Bair, AT, Alexis Cleveland, AT, and Sarah Orr, AT, support staff athletic trainers at the Center for Sports Medicine. The UVMC Center for Sports Medicine is located at the Hyatt Center, 450 N. Hyatt St., Suite 102, Tipp City. For more information on programs, call (937) 440-7152 or (937) 667-2614 or visit the web at UVMC.com. https://www.dailycall.com/wp-content/uploads/sites/30/2019/03/web1_2019-Athletic-Trainer-Group-Photo-1.jpgProvided photo Premier Health athletic trainers were recognized.